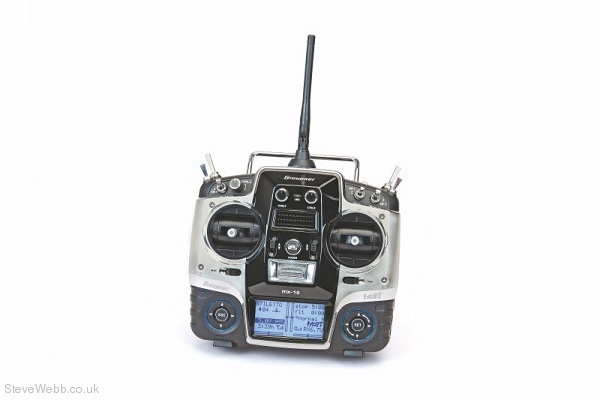 With 8 control functions, the mx-16 enables the advanced RC model builder to control nearly any model. The use of Graupner HoTT 2.4-GHz transmission technology ensures great functional safety through bidirectional communication between transmitter and receiver, with the ability to connect a telemetry box to the transmitter. The transmitter has 12-model memory. Programming through simplified programming technology with toggle and cut-off switches. A contrast-rich, 5-line graphic display ensures perfect display of all settings and parameters. A contrast-rich, 4-line multi-data display ensures perfect control of settings and parameters such as model type, model memory, clocks, and operating voltage. Graupner HoTT mx-16 microcomputer transmitter with built-in RTU NiMH-transmitter battery 2000mAh, Graupner HoTT GR-16 receiver, switch cable.